I hope you all had a wonderful Thanksgiving. Christmas is right around the corner so it’s time to get started decorating your home for the Holidays. The next few weeks I’ll be sharing some inexpensive, easy DIY decorating ideas with my Rancho Interior Design clients. If you have ideas, please send them to me and I will share them on my blog. 1. I love using natural elements in my decorating. Gather natural branches or find them at your local craft or floral supply store and spray paint them silver or gold. Place them in different size and shape vases for an elegant display. You can add ribbon or ornaments for an even more festive look. 2. Decorate with ornaments in a sophisticated way. Gather clear glass tumbler vases in different heights and sizes. Purchase glass ornaments in 1 or 2 colors. Fill the glass vases with the ornaments and arrange the vases as a collection. Use an odd number of vases which is most appealing visually. You can add candles in glass vases or small votive candles to the display for even more impact. The display will be beautiful when the light reflects off all the glass vases. 3. A fun idea is to wrap some sofa throw pillows with fabric and ribbon. Toss them on your sofa for a festive look. 4. Find or purchase some cute frames and frame pretty gift wrap paper or Christmas cards. Place the frames on a mantel or table or group them on a wall. 5. Fill holiday plates or chargers with ornaments, pinecones, berries and branches. Add candles in hurricane lamp vases and use as a centerpiece. Try some of these ideas to add a festive look to your home this Holiday Season. We have all gone through difficult economic times these past few years. Most of us have felt the squeeze in one way or another. Some of us have lost our jobs. Some of us have lost our homes. Some of us have seen our life savings disappear. Many of us have had to tighten our belts and cut down on the non-essentials. Despite all this I remain optimistic that the future holds promise for us all. I am thankful this Thanksgiving for the blessings that I have been given. We at Rancho Interior Design are thankful for all the wonderful clients we have had throughout the years. Thank you for your confidence and trust as we worked together to design your lovely homes. We look forward to meeting and working with many more wonderful people in the coming year and helping them make their interior design dreams a reality. Remember we can work with any budget so don’t hesitate to give us a call for some interior design ideas. Have a wonderful Thanksgiving. I saw an ad recently in Architectural Digest for Linge Roset furniture. The headline was “Staying Home is the New Going Out to a Fancy Place”. I thought what a great ad! In these rough economic times, we are all modifying the way we spend and for a lot of us that means cutting back on how often we go out to a restaurant or club. We’re staying home and entertaining at home more than we have in recent times. It is reminiscent of Mid-Century America where cocktail parties and bridge clubs were a weekly occurrence. We are embracing the lifestyle, enjoying shows set in those times and even decorating our homes with the look of that era, 1950’s-1960’s America. So with that in mind, many of us are choosing to stay home and spend money on making our homes more comfortable and cozy. Here are a few remodeling design ideas to get you started. Begin by deciding how much you want to spend on design changes. Look at your space and determine the function of the room and the mood you want for the space. Look at the furniture arrangement and determine if it is working for you. Determine what is working for you and what is not working. Do you have enough seating? Do you have adequate surfaces for food and drinks? Will you need extra tables when entertaining? How about lighting? You should have adequate task and ambient lighting in the room. How about style? Are you happy with the style or do you want a complete new look? Maybe you want to add or change wall colors. Paint can transform the mood of a room instantly. If your budget allows, add a new piece of furniture like a sofa for more seating and a style update. If you can’t afford new furnishings add new pillows in fun colors and patterns. Add carefully chosen unique accessories with a similar look or color to tie the room together. In place of greenery or plants try filling glass vases with real branches to add a pretty, natural look to a room. Add new area rugs to define your seating areas and add color and texture to the room. Speaking of Mid-Century design, a new fun idea is to add some vintage pieces to the room. How about a 50’s style bar you can pull out from the wall when entertaining and then put back along the wall as a console/sofa table to display some accessories, books or additional lighting. Check out local antique and resale stores to find authentic pieces that will work for your space. Frames are a trendy way to decorate your walls. Use different styles and group them together with photos, artwork, mirrors, other interesting items or even display them empty. Interesting, pretty, unique or distressed frames become art in themselves when grouped together. Accessorize with care and thought. 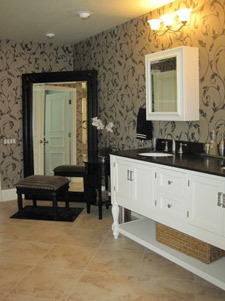 Rancho Interior Design specializes in Residential Interior Design. In our blog we will be sharing the latest new ideas and trends in the Interior Design world. Watch for our new posts and feel free to send us your design dilemmas. We’ll be happy to help you out with design advice.